A ballerina spins rapidly in her execution of a pirouette. Courtesy of Leon Neal. Everyone is familiar with the not-so-pleasant feeling that follows a ride on a merry-go-round — even though we are standing still, our brains still perceive movement. Even just briefly spinning around in circles can leave one dizzy and disoriented. While on stage, ballet dancers must stay focused and balanced, even when performing numerous consecutive pirouettes. Courtesy of Herbert Migdoll. Interestingly enough, ballet dancers can execute multiple pirouettes without becoming dizzy. Of course, practice plays an important role. 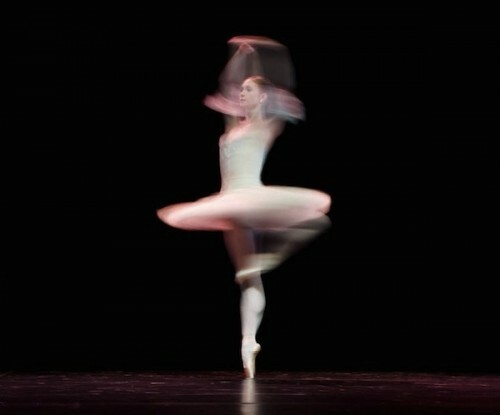 Professional dancers train themselves to focus on one spot while performing complex spins, a technique known as “spotting.” However, researchers at Imperial College London have also found a physiological basis for this ability: Their brains have adapted to become less sensitive to dizziness. Professional ballet dancers execute countless pirouettes while training. Courtesy of Suzanne Kreiter. The culprit responsible for dizziness is fluid-filled chambers of the inner ear, known as vestibular organs. After we stop spinning, the fluid continues moving, sending signals to the cerebellum and creating the sense that our bodies are still in motion. However, MRI scans of the brains of ballet dancers demonstrated that this signal processing area in the cerebellum is significantly smaller in dancers’ brains than in brains of the general population, suggesting that dancers have come to rely less on information from their vestibular organs. The study also found that fewer signals were being sent to the cerebral cortex, a region of the brain responsible for the perception of dizziness. A ballerina can execute multiple pirouettes without becoming dizzy. Courtesy of Bill Cooper. This research, besides demonstrating the amazing ability of the brain to adapt to the needs of its bearer, could be essential in treating patients suffering from chronic dizziness. Perhaps in the near future, that nausea-inducing carnival ride will be something everyone can safely enjoy.